Now here's a college supply that will take you back more than a few decades. 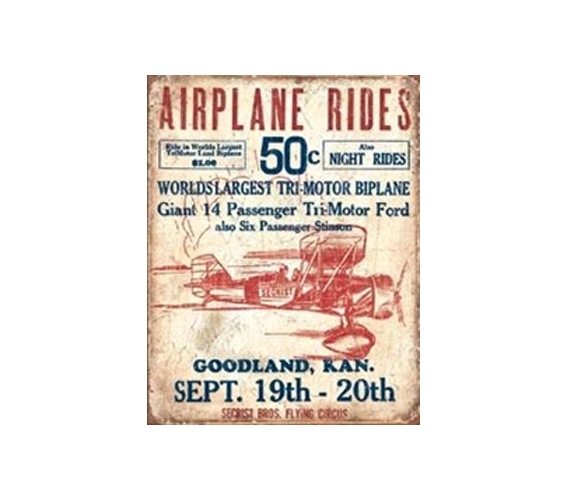 This Airplane Rides Tin Sign isn't just retro, it's plain (or should we say "plane") old fashioned! Nonetheless, it's a cool dorm supply that will give a unique look to your college supplies. After all, what other old-fashioned college items will you have? If anything, you'll want to be trendy with your twin XL dorm bedding and your college futon and other dorm furniture. But when it comes to your dorm room wall decor, you can have some fun and bring on the old-time vibes. Fun and cheap tin signs are college essentials to that effect, so don't forget to put a couple on your dorm checklist.